Directly facing the splendid Gulf of Orosei, the Hotel Villa Gustui Maris is about 300 metres from the sea (on the cliff side without direct access) and just 600 metres from the first beach and the centre of the famous Cala Gonone, the village and seaside resort of the town of Dorgali. “Gustui”, which in the Sardinian language means "to one’s taste, pleasurable", is the name of the area in which the Hotel is located. The Hotel is the ideal base for exploring 40 km of wild and breath-taking coast: Cala Luna, Cala Biriola, Cala Mariolu are just some of the stunning coves lying on this stretch of Sardinia's eastern coast. Nestled at the foot of Monte Irveri, Cala Gonone offers besides the sea, thick forests and wild countryside dotted with the ruins of the ancient nuraghi. During your holiday you should not miss the aquarium of the nature park "La Favorita" and the spectacular "Bue Marino" sea caves. The closest airport to Hotel Villa Gustui Maris is Olbia – Costa Smeralda (69.1 km). Charming recommends its guests to rent a car, since the hotel is a bit isolated from the town. Built and furnished in immaculate Mediterranean style, Hotel Villa Gustui Maris is set in a carefully landscaped garden with the swimming pool and sundeck, overlooked by a panoramic terrace. This 4-star Hotel offers guests high-quality service and a relaxing stay in a reserved, quiet and peaceful ambience. It has 34 rooms, several comfortable common areas, a restaurant and a bar. Elegantly furnished, the Hotel's rooms are spacious and offer all mod cons: air conditioning, Sat-TV, minibar and safe. They have an en-suite bathroom with shower or hydromassage bathtub and a balcony, terrace or window from offering splendid views of the sea and mountains. Prestige Cala Sisine (19 sqm) – comfortable double and triple rooms with en-suite with shower, balcony or terrace with mountain or sea view (extra charge). 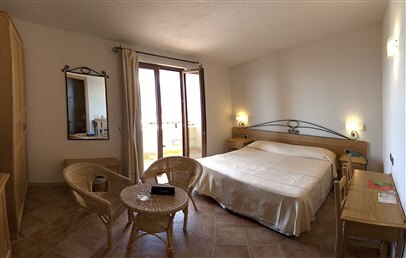 De Luxe Cala Mariolu (22 sqm) – double or triple rooms. They have en-suite with shower or hydromassage bathtub (extra charge), small balcony, divided by planters, with sea view. Exclusive Cala Goloritzé (22 sqm) – double rooms with shower or triple rooms with hydromassage bathtub. They have a panoramic view on the sea or mountain and a balcony. Your holiday at the Hotel Villa Gustui Maris includes a rich Italian and continental buffet service breakfast served on the terrace with a view over the Cala Gonone bay. The choice includes: yoghurt, cold cuts and mixed cheeses, cereals, bread, biscuits and cake, jam, honey and fresh fruit. The Restaurant, on the other hand, proposes the typical dishes of the local tradition and Mediterranean cuisine served in a welcoming dining room with chestnut wood furniture and with sea view. The Hotel also has a bar with a large terrace overlooking the swimming pool. Guests can request several extra services at reception (open 24/7), including bike rental, laundry and room service. Free of charge services include outdoor car park, treadmill and cyclette, safekeeping of valuables, luggage deposit, services for the disabled. Simple and finely furnished, they have the full set of cons: air conditioning, Satellite TV, minibar and safe. The en-suite bathroom has shower, hair-dryer and complimentary toiletries. The windows of the Standard rooms offer a view on the garden, mountain or patio. Spacious double or triple rooms provided with all modern comforts: air conditioning, Sat-TV, minibar and safe. The en-suite bathroom has shower, hair-dryer and complimentary toiletries. The Superior rooms have a balcony with sea view. Spacious and welcoming double or triple rooms provided with all modern comforts: air conditioning, Sat-TV, minibar and safe. The bathroom has a shower or hydromassage bathtub (extra charge), hair-dryer and complimentary toiletries. The De Luxe rooms have a small balcony, separated by planters, with sea view. Spacious double or triple rooms provided with all modern comforts: air conditioning, Sat-TV, minibar and safe. The en-suite bathroom has shower, hair-dryer and complimentary toiletries. The Prestige rooms have a balcony or terrace with sea view. Prestigiose double rooms provided with all modern comforts: air conditioning, Sat-TV, minibar and safe. The en-suite bathroom has shower, hair-dryer and complimentary toiletries. 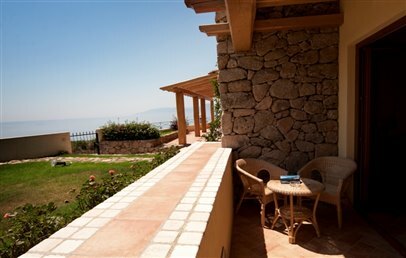 The Exclusive rooms have a balcony with panoramic view on the sea or the mountain. Only for Charming customers: a small Welcome gift upon arrival!